Potable water—it’s the very lifeblood of all creatures great and small. As cruisers, our primary concern is having enough of it, which is simply a matter of storage capacity or perhaps the ability to make water using a reverseosmosis watermaker. However, there are other concerns, beyond sheer quantity and the ability to store this liquid resource, that are worthy of discussion. While potable water systems typically are quite simple, it’s important that they work correctly and safely. One of the primary goals of a potable water system, therefore, is equally simple: above all else, its components must be sanitary. It’s critically important that the fresh or potable water system aboard your vessel not harbor any diseases, bacteria, viruses, or anything else that may be harmful to you or your crew. While it’s unlikely that the system will remain absolutely sterile, every effort must be made to keep it as clean as possible.Material selection will play a role in how clean your potable water system remains, as will the maintenance you provide. Additionally, your potable water system must be as reliable as possible, and, ideally, it should be free of leaks. 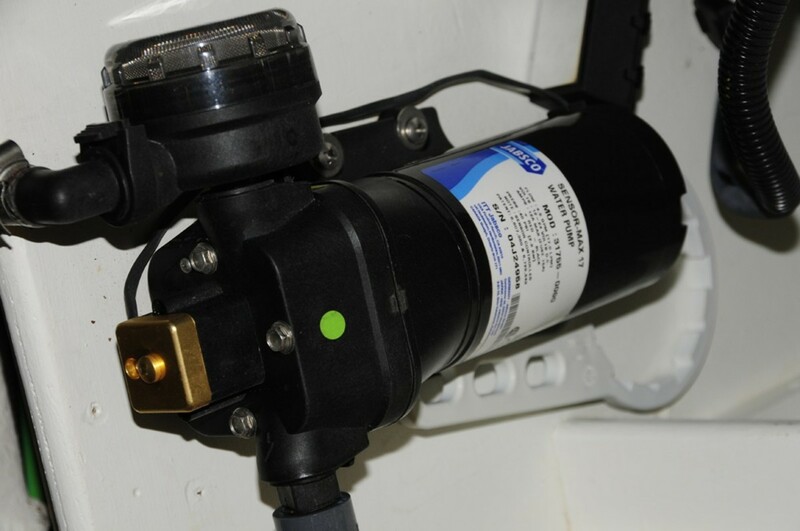 Potable water is a precious commodity aboard most vessels, and even if you have a watermaker, it’s unlikely you’ll want to waste water by allowing it to leak into your boat’s bilges. A leaking potable water system often causes the pressure pump to cycle needlessly, shortening its life. Another concern is that leaks can be a source of entry for germs, bacteria, and other organisms that should remain outside of the system. When you do have a choice or are in a position to influence one, you should make every effort to install potable water system equipment in accessible locations, placing those components that are more likely to require frequent access in the easiest-to-reach spots. For example, pumps, filters, and accumulator tanks should be high on the “access” list, while water heaters and distribution manifolds should rank somewhere in the middle, and individual plumbing runs and fittings can appear lower on the list. Perhaps the most important decision to be made in ensuring the reliability, integrity, and healthiness of a potable water system is the selection of materials from which it is constructed. Several organizations weigh in on potable water and the materials that may be used for its storage and conveyance. Two of these organizations— Underwriters Laboratories (www.ul.com) and the National Sanitation Foundation, or NSF (www.nsf.org)— make little or no distinction between potable water systems in homes, businesses, and boats. The American Boat & Yacht Council, however, specifically addresses seagoing potable water systems, along with virtually every other system found aboard a cruising vessel. Section H-23 of the ABYC’s Standards & Technical Information Reports for Small Craft provides a great deal of detail concerning potable water systems, as well as a list of acceptable construction materials. Other organizations set standards on potable water, including the FDA, CSA (Canadian Standards Association), ASTM (American Society for Testing and Materials), ANSI (American National Standards Institute), IAPMO (International Association of Plumbing and Mechanical Officials), and UPC (Uniform Plumbing Code). In general, however, materials that meet applicable NSF and ABYC guidelines are safe for use in a vessel’s potable water system. Clearly, the materials selected for potable water systems must be not only capable of conveying potable water but also properly rated for this function. All materials that come in contact with potable water must be corrosion resistant; they must not impart any taste, color, or odor to the water; and they must be galvanically compatible with each other. Approved materials include “lead-free” copper alloys, which comply with the National Safe Drinking Water Act of 1986. This legislation mandates that pipes, fittings, and pumps contain no more than 8 percent lead and that solder and flux used for pipe connections contain no more than 0.2 percent lead. Additionally, 300-series stainless steel, nickel-copper alloys, NSF-conforming plastic and rubber, and glass-lined metal (used for many water tanks) are all acceptable materials. Hose or tubing used in potable water systems, regardless of its material makeup, must be specifically designed for potable water use. There are two ways to make this determination. The first and most definitive way is to read the information printed on the surface of the hose or tube. If it says “NSF-61,” then it is specifically designed for potable water use. If, however, it says “NSF-DWV,” that means the hose or tubing is designed for drain, waste, and vent systems—certainly not potable water. The second method requires research (and documentation, if you are a professional boatyard technician or boatbuilder). If what’s printed on the hose or tube contains a manufacturer’s name and a part number or model name, then the user may contact the manufacturer to determine whether it is approved for potable water use. Take note: just because a certain material, such as clear PVC, is commonly used for potable water applications, that doesn’t mean all tubing made from that material is suitable for potable water. Cross-linked polyethylene tubing is frequently used for potable water applications, and, provided it carries the “NSF-61” or “potable water” designation, it’s well suited to the role. However, polyethylene-clad aluminum tubing, sometimes referred to as PAP or PEX-AL-PEX, is designed for use in radiant heating systems and is not specifically approved for potable water use; it does not carry NSF-61 approval. As previously stated, the material used for the plumbing in a potable water system must be designed for the safe conveyance of potable water. Beyond that, a variety of options exist. 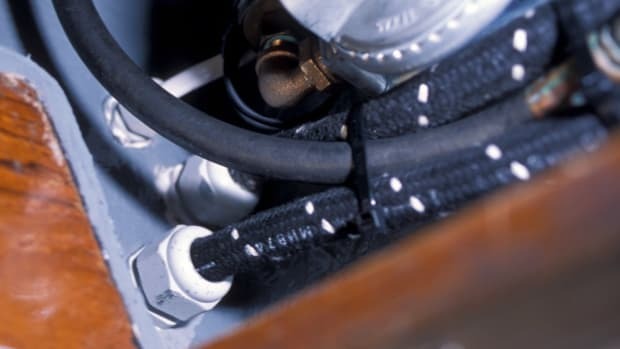 Traditionally, marine potable water plumbing systems were custom-made and installed using either copper tubing similar to that used for household applications or clear PVC (polyvinyl chloride) hose. The inside diameter of the plumbing is typically a minimum of 1/2 inch. Most pumps deliver pressure in the 35–60psi range, so the plumbing must be capable of operating under this pressure, and preferably more to handle the occasional surge or malfunctioning pump pressure switch. Of course, plumbing used for hot water must be capable of working properly under higher temperatures (I’ll talk more about hot water and water heaters later on). Both copper and PVC tube work well, but they are not without their limitations. On the plus side, copper tubing is durable and acts as a natural biocide; it prevents biological growth and keeps out light, which is necessary for algae and plant life to grow. On the downside, copper tubing is expensive and time consuming to install and is an excellent electrical conductor, so if a vessel’s electrical wiring should happen to make contact with it (through chafing or crushing), a short circuit may occur. Additionally, because of its galvanic incompatibility, copper plumbing must not be installed in aluminum vessels. If used with water that is acidic (with a pH lower than about 6.5), copper is susceptible to structural degradation and “leaching,” whereby copper particles are shed into the water. Copper’s durability ensures that, with just a few exceptions, a copper plumbing system will last the lifetime of the boat. Copper plumbing simply doesn’t fail or leak, provided the materials for the system are chosen correctly and are properly installed. I’ve seen 40-year-old copper plumbing systems whose fixtures have been replaced and upgraded on multiple occasions throughout the boat’s life, and the plumbing works as well as it did the day it was installed. If you use copper tubing, which is annealed and therefore can be bent when needed, it should be seamless type K or L tubing (type K has a slightly thicker wall). Annealed copper is also capable of being flared for connection purposes. Flaring is an excellent method of plumbing termination because it requires no heat or solder—only a flaring tool and an understanding of how it’s used. Copper pipe, on the other hand, which is used extensively in homes and businesses, is tempered and thus is designed to be soldered. Because copper pipe is rigid and cannot be formed or bent during installation, and because it’s usually soldered (compression fittings also will work), it’s not typically used aboard cruising vessels, although I’ve seen a number of older boats, often active or former commercial vessels, that have used soldered copper pipe for potable water and heating systems. Clear PVC hose has also been used extensively throughout the marine industry, and with good reason. It’s exceptionally easy to install and is relatively inexpensive. Connections and terminations are made with simple, barbed pipe-to-hose adapters and common hose clamps, making repairs easy. Beyond these attributes, however, there’s not much about clear PVC hose that’s desirable. It is prone to kinking, crushing, splitting, and flattening under vacuum. Additionally, when it’s used for hot water, it tends to distort or soften, often releasing from the fittings to which it’s clamped. The specifications of many clear PVC hose varieties identify them as being designed for “unpressurized” cold-water applications. There are heavy-walled, filament-reinforced varieties of clear PVC hose that are less prone to these failures, but they tend to be quite stiff and difficult to work with, and they’re more costly. Most clear PVC tubing is designed to operate at either low or no pressure, or up to about 150psi, depending on the reinforcement. The maximum permissible temperature is rarely above 150°F. Most importantly, clear PVC—or any clear material—that’s carrying potable water will support the growth of algae and plant life. I’ve seen countless potable water installations utilizing clear PVC, and many were infested with black or green bio-colonies that were clearly visible on the inside of the hose walls. PVC pipe and CPVC (chlorinated polyvinyl chloride) pipe, which are quite popular in residential and commercial buildings, are viable options for marine applications. (Because of their impermeability, these materials also are ideally suited for sanitation systems.) PVC and CPVC pipes are strong, relatively inexpensive, and easy to install using primer and glue combinations. Because these pipes are relatively rigid, however, they’re difficult to work with for the short, less-than-straight runs often found on small and medium-sized boats and thus may be impractical for some installations. An alternative is gray, flexible PVC-like tubing that at one time was made from polybutylene; however, it’s not without its own set of caveats. When I worked as a marine mechanic and winterized vessels, the last thing I wanted to see upon boarding was yards of gray polybutylene tubing used in the potable water system. Disassembling these systems for the purpose of removing water and adding nontoxic antifreeze or bypassing tanks and water heaters was difficult, at best, and nearly always resulted in leaks or broken components. Eventually, most mechanics tasked with winterizing these systems (myself included) would amass a sizeable collection of adapters, T-fittings, and unions in order to complete the job. Polybutylene-based systems, which gained wide popularity for use in mobile homes and a number of production boats in the ’70s and ’80s, tend to be troublesome, unreliable, and, as previously mentioned, difficult to work with. (There have been class-action lawsuits related to one brand of this product where it was used in homes; no such luck for boat owners.) In short, polybutylene tubing tends to become brittle and fracture with the passage of time or as a result of stress and movement, which is unavoidable aboard a boat. For this reason, polybutylene hasn’t been used in the marine industry for several years, although many boats equipped with these systems are still in use. The successor to polybutylene is cross-linked polyethylene (also known as PEX). This is a case of getting it right the second time around. Cross-linked polyethylene tubing is ideally suited to marine potable water applications. It’s made from high-density polyethylene (HDPE), the same material used for some dripless stuffing boxes, as well as a wide assortment of products outside of the marine industry. HDPE is strong, relatively light, and extremely flexible regardless of temperature, and it does not suffer from time-induced embrittlement. PEX tubing designed for potable water systems is available from several manufacturers (www.seatechinc.com and www.whalepumps.com are two). It’s used aboard cruising vessels and RVs, as well as in homes and other shoreside structures. One of the advantages of using proprietary systems made from PEX is that they are essentially off-the-shelf kits. Manufacturers offer a wide array of tubing diameters and several colors, including red and blue (for hot and cold water, respectively), as well as connectors, valves, manifolds, and other fittings that enable the installer to plumb virtually any type of fitting, fixture, or vessel. Other than a tubing cutter, no special tools are required, and the installation technique can be mastered easily by professionals and do-it-yourselfers alike, with a minimal amount of practice. As desirable as PEX systems may be, they do have shortcomings, albeit minimal ones. There are two primary fault potentials. First, the tubing terminations usually consist of a body, O-ring, and collet. If the tubing is angled or side-loaded where it enters this body termination assembly, it will often leak. The O-ring makes an effective watertight seal, but if the tubing does not pass through the O-ring at a right angle or nearly so, the seal is compromised. Minimizing side-loading in these installations may take some practice. It can be achieved by using either a 90-degree fitting or an accessory fixture that induces a gentle, 90-degree “sweep” into the tubing, both of which enable the correct alignment between the tube and the O-ring seal. Properly supporting the tubing also minimizes the likelihood of poor angle entry and the resultant leaks. The second fault potential stems from the fact that the watertight pressure seal is formed between the O-ring and the outer surface of the PEX tubing. If this surface is marred, nicked, or scratched, the O-ring may not be able to achieve an effective seal. For this reason, it is important to closely inspect the tubing for any damage before inserting it into the termination fitting. A final note on PEX systems: most manufacturers of this product caution against the use of sealants, or pipe “dope,” which may adversely affect the plastic connection material. Sealant must not be used on the O-ring connections themselves. If sealant is required on threaded connections, be certain to use a paste or compound that is not harmful to plastic (the product’s container usually will indicate any incompatibility issues, particularly with plastics). One product that’s safe for use with potable water systems and most plastics is Leak Lock, manufactured by Highside Chemical (www.highsidechem.com). Of course, any sealant used on a potable water system must be specifically compatible, carrying an NSF or FDA rating. Teflon tape is also suitable and works well in this application. Beyond what is mentioned above, there’s little that can go wrong with a PEX system. It can be argued that if the plumbing used for a potable water installation is analogous to the body’s circulatory system, the pressure pump represents its heart. Pressure pumps used for potable water systems are available in several different varieties, but the most common are the traditional diaphragm-style pump and, more recently, the multichamber diaphragm or wobble-plate pump. The former utilizes the familiar exposed cogged belt or direct-drive motor, whose rotating motion is converted to reciprocal movement via a crankshaft and connecting rod. Multichamber diaphragm pumps use a series of small diaphragms (typically four or five) that are activated by an offset or eccentric plate, called a wobble plate, housed within the pump head. These pumps are compact, and their design eliminates the need for a belt or connecting rod; all moving parts are contained within the pump. Their output pressure is noticeably more consistent than that of the traditional single-diaphragm pump, whose jerky motion produces a pulsating water flow at faucets and showerheads. Most potable water systems benefit from the addition of an accumulator tank. Accumulator tanks utilize a canister, which may be either plastic or metal, and air pressure to minimize the pulsation caused by a diaphragm pump. The tanks are plumbed in parallel—that is, they are “T”’d into the cold-water side of the system. As water enters the accumulator tank under pressure, it encounters a “charge” of air pressure that is maintained within the tank via a diaphragm. (In some cases, the air pressure can be adjusted via a tire-type Schrader valve and monitored with an attached pressure gauge; most tanks come pre-charged with between 10 and 20psi.) A functioning accumulator tank is a virtual necessity for any pressurized water system. It provides smoother, more consistent water flow and lengthens the life of the pump. If the air within the tank escapes or if the diaphragm fails, a change in water pressure characteristics at the faucet is often immediately noticeable. A variation on the multichamber diaphragm pump introduces speed control, which manages water pressure based on demand. As demand increases, so does the speed of the pump’s motor. The result is smoother, more consistent flow without the need for an accumulator tank. Whichever system or pump style is used, a few rules of thumb apply. Most potable water system pumps utilize some type of diaphragm and check-valve arrangement—in some cases, several. Although diaphragms and check valves generally are long-lived and reliable, check valves are susceptible to failure as a result of fouling with debris. Even the smallest piece of plastic, rubber, or other material lodged within a pump’s check valve will prevent it from operating properly, if at all. Most pumps, therefore, will benefit from having a screen or pre-filter installed before the pump (often, these are made of wire mesh). It’s important to note that some pump manufacturers specifically prohibit the installation of conventional fiber or charcoal filters before the pump because they can cause cavitation, poor performance, and, in some cases, damage to the pump. Always follow the manufacturer’s instructions for the specific pump you’re using. Water pumps should be selected based on the number of fixtures that may be in use aboard a vessel at any one time. The measurement used to determine a water pump’s capacity is typically the number of gallons of water it can provide in one minute, or gpm. A small boat with two fixtures that may be used simultaneously—a galley sink and a shower, for instance—would require approximately 3gpm. A larger yacht may require between 4 and 10gpm, and in some cases more, depending on the number of fixtures and the types of appliances that may be used simultaneously. Water pumps used in potable water systems should be self-priming or easily primed. They also should be capable of running dry without sustaining damage, something that depends on the type of pumping mechanism inside the pump. Most diaphragm pumps are able to run dry without incurring damage, while flexible impeller pumps typically cannot run dry for more than a few seconds. Higher quality pumps that will suffer from damage when run dry often incorporate an automatic shutdown system in the event that a tank runs dry or water suction is lost. It’s worth looking for this feature in such pumps. Before delving into this subject, let’s get the terminology straight. As a colleague of mine often reminds me, to call it a “hot-water heater” is redundant. It’s a water heater. For the most part, this relatively simple device is quite reliable, and the amortized cost of ownership is usually low indeed. In my consulting and boatyard experience, I’ve found that even the least expensive marine water heaters, while often less than efficient, typically last for a decade or more. As is frequently the case with marine gear, disuse and corrosion are the marine water heater’s greatest nemesis. The primary mission of a water heater is to efficiently make and store hot water. Before determining whether the unit you choose does this, you must first define “hot.” In my experience, the difference between a hot shower and a chilly one is just a few degrees, and the dividing line between the two is roughly 105ºF. Below this temperature, you won’t have to worry about your crew wasting water while languishing under the showerhead. A heat exchanger, using the same principle as your engine’s closed cooling system, passes heat from the engine’s cooling circuit to the water heater’s domestic water, without the two ever mixing. Large, well-designed heat exchangers do this very efficiently. Smaller, poorly designed units don’t do it as well, which necessitates more engine run time before water is hot enough for bathing or to use for cleaning. “Safer” double-walled heat exchangers will “weep” coolant externally in the event of a failure, giving the user a warning that something is amiss. These exchangers lessen the likelihood of coolant leaking into the water heater’s potable water circuit, but they do so at the expense of efficiency. Air serves as the medium between the inner and outer walls in a double-walled heat exchanger, considerably reducing its effectiveness. Is heat exchanger leakage a problem? In my experience, it’s rare. I’ve never seen a high quality, name-brand water heater suffer a heat exchanger leak. On the other hand, I have seen a cheaply manufactured unit, whose name was unrecognizable, do just that. If you opt for a single-walled heat exchanger, pay attention to the taste and odor of your hot water. If it bears the slightest hint of coolant—a somewhat sweet smell and taste—have the system pressure-tested immediately, and don’t use the water until the problem is resolved. Keeping the water hot long after it’s been made is nearly as important as making it in the first place. How this is done varies little, in theory, from manufacturer to manufacturer. Much like a refrigeration system, you can’t have too much insulation when it comes to water heaters. (I’ll discuss insulation choices in Part II of this article series.) Just like “the right temperature,” heat retention also requires a range or guideline. Ideally, your water heater will maintain water that’s hot enough to take a shower (around 105ºF) at least 12 hours after you’ve shut down the engine or shorepower. Some especially well-designed, high quality water heaters will maintain this temperature for 20 or more hours, depending on the ambient temperature. Consider the 12-hour mark a minimum, and 20 hours the ideal. Be prepared to pay a premium for the latter. Water heaters that are capable of this type of heat retention aren’t inexpensive, but they’re not always the most expensive units on the market, either. Remember: you can always supplement your water heater’s insulation with conventional thermal insulation products at a very reasonable cost. I’ll talk more about water heaters in Part II of this article series. Check the next issue to learn more about the design of water heaters and the materials from which they’re made. I’ll also discuss filters for your potable water system, and how to clean your freshwater tanks.